All you designers who think a cushy leather chair is just perfect in the bathroom with an oriental rug and a lamp... what in the world do you expect people to do in there? And what exactly is a steam shower for? If it can be used as a supersonic wrinkle remover for my clothes, then you might win me over, but if the purpose is to get clean, does it really do the job or just leave you sweaty like a sauna? And why do you like to recommend leaving your bathroom window exposed to let the natural light in? Do you people live in real neighborhoods and have you never heard of binoculars? I don't have windows in my master bath, but my neighbors do and let's just say I am very glad they are not that internet savvy. Now, here's a serious one for all of you non-designers... do you think vessel sinks are just a fad or here to stay? We aren't considering one, just having a discussion while we peel off wallpaper and sand down walls. Oh, and I'd love your thoughts on subway tile. Does it scream retro chic or New York City rush hour? I think the leather chair in the bathroom is a nice look if you have a HUGE bathroom. I don't think it's meant to be used unless you are one of those people who talk to their spouse while they shower or poop. The sink is nice but I don't think they will be around forever. I LOVE the subway tile, go for it! Who spends that much time in the bathroom? My goal is to get in and out before the hordes descend on me. I surely wouldn't have a neat chair in there so the kids start out with me in the bathroom. I like the vessel sinks, but there's no way my children could use it without making a mess. Steam shower sounds great for croup - are they marketing it with an exhausted looking mommy holding a cranky infant? I'd buy it if that were the case - truth in advertising. We have windows in 2 of our bathrooms and both have frosted glass. The window treatments are purely decorative since you can't see in or out of the windows. I hope. As for subway tile - I think it's a bit trendy. It depends on the rest of your house, though. And if you plan on selling in the next few years. I personally don't like it. Steam showers are awesome for asthmatics and those with chronic allergies and other breathing issues. I suffer from a we bit of asthma and year-round allergies. When I'm feeling wheezy or sniffly, I tend to run the shower hot and let the steam build up in the room, it helps clear the lungs and sinuses and ease breathing. I don't get the leather chair though. Or open windows. Or the vessel sink. That last looks like a pain to clean. I'm sure gunk would build up all along the bottom where the bowl meets the counter. Ugh I hate cleaning bathrooms as it is. That just looks like a major hassle. I like the tile!! Think how easy it would be to clean and it looks very nice. I do like the vessel sinks too, though they probably are a fad. Maybe a chair would be nice, but only if the door had a lock!!! And I was thinking the same thing about the mess factor with the sink. Amen!!! Do you remember that movie Crazy People...Volvos: boxy, but good! See, I would have thought they were talking about frosted glass windows, but in all of the pictures I saw, they weren't. Some of them, the windows were even open so if your neighbor wanted to, he could hear you in the bathroom, not just see you! Most articles I read said that is EXACTLY where the gunk tends to accumulate on those vessel sinks. And, what people don't realize is that you have to lower the height of the counter it's on to make it work. I think I would feel like I was living in Munchkinland. A lot of people in "the biz" think they are here to stay. In fact, most of them point to the fact that they aren't really new, just a reinvention of the old pitcher and wash basin idea from ages ago. Thanks ladies for the conversation! Actually, I think that subway tile would be more difficult to keep clean. I think it can look nice, but we have wainscoting in our bath, and I think it looks a bit warmer. So much bright white tile looks cold to me, but the same color in wood is warmer/charming. Lol about the leather chairs. I do sometimes wish we had room for a regular chair. It would be nice for laying out clothes, towels for guests, sitting and trimming toenails or resting while pregnant when bathing littles, etc..., especially when pregnant. And, I do like to come talk to my husband while he showers in the morning. Sometimes its the only chance we get to be alone. It would be sort of cozy to curl up in a leather chair instead of balancing my coffee and breakfast on my knee while sitting on the toliet lid, lol. Windows = my love of the light overcomes my fear of being exposed! I like the look of the subway tile, as long as I wasn't the one responsible to clean it. All that grout it just begging for mildew monsters to invade. If you are an extreme cleaner, it wouldn't be a problem. But I'm more of quick wipe down gal than scrubber! I love the sink. It would make me feel like I was on vacation! 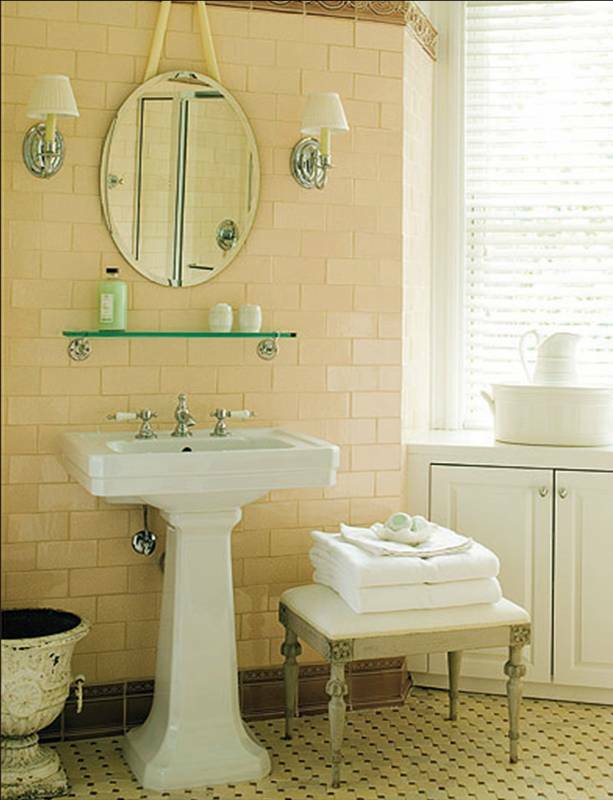 I love subway tile, I think it's classic. Vessel sinks, not so much, especially the glass ones. They're nice for fancy offices but not for homes, unless you live in a show home and can afford to redecorate every 10 years. We have a window in our 2nd story bathroom and I love it. I hate bathrooms without windows, but here in the PacNW mold and mildew are big problems. Having the windows open year round really helps--most houses here don't have a/c. One of my favorite houses we looked at several years ago had a corner window above the bathtub. Loved that! Yeah the difference between the vessel sink and a pitcher and basin is the pitcher and basin could be lifted and cleaned. Yikes a shorter counter is definitely out in my book. Already I find most counter tops are too low and give me a backache. But I think Lindsay might have sold me on the leather chair: "resting while pregnant when bathing littles"
If only our bathroom were big enough for a chair! Or even big enough that I'm not constantly banging my elbows and knees while bathing the littles. I find the closed toilet seat not nearly comfortable enough. Especially when pregnant. Subway tile - neat, cool. too much grout to clean for me though. Leather in a bathroom - too heavy. I'd do linen upholstery. Of course we don't have any of these things. What fun it must be to remodel your bathroom. I'm enjoying it with you! Other than the tile issue (because we are having to replace what was there) these are not our considerations, merely questions and conversations that have been sparked between Husband and I as we look at the ridiculous number of "bathroom remodeling suggestions" that are available at our fingertips. I still have yet to find a website that features practical, functional, real family bathroom designs. If anyone finds it, please let me know! We have all tile bathrooms. Absolutely no painting, ALL tile and I love it. We literally wash down the walls and get the whole thing clean!!! I love subway tile and we have a variation of it in our bathrooms. You've intrigued me. What does a variation of subway tile look like? I love subway tile and we put it in both of our full baths. I live in a 100 year old house though, so it suited the style of the house to try to go retro. Lowes used (and may still) have larger rectangles (6x8?) that looked sort of like oversized subway tiles, if you wanted the look, but also wanted to use fewer tiles. In our master bath, we did put in a vessel sink. Not because I loved them or wanted to be trendy, but because the best way to fit a sink into a narrow space and have drawers (instead of a pedestal sink) was to convert a skinny dresser into a sink cabinet and put a vessel sink on top, so that we only had to cut a pipe space out of the drawers. I didn't worry about height considerations. It's a bit higher than most sinks, which means our kids have to climb on the counter to use it. Otherwise it's fine. I don't think I'd put a leather chair in a bathroom, but I do have a kitchen chair with an oilcloth (basically vinyl) seat. It's nice to sit on when getting dressed or to put a book on when I'm reading in the bathtub. I like the idea of a leather chair for all of the reasons mentioned. However, our bathroom is not big enough for it. We are thinking of remodeling soon. No subway tile, but tile of some sort (mixed with paint because it is so easy to change). And yes, I want a vessel sink only in ceramic. And we also have a window in both bathrooms, but it is frosted as well. And I must admit when I first saw a vessel sink (probably 8 years ago), I thought they were the strangest looking sinks I had ever seen. But they are very popular and have grown on me a bit! I've recently been taking my iTouch and hiding in the bathroom to check email. A comfy leather chair would be very nice. Subway tiles can work if you do it right. I'm pretty sure that mildew is only an issue if they regularly get wet and/soapy. I think soap is a "food" for mold and mildew. Don't quote me on this though. I do like wainscoting in bathrooms as well. Wainscoting is much easier to "change" if you don't like the look 5 years later. Tile is there to stay, so you better like it. Vessel sinks look cool. They won't last (guest baths, perhaps, but not real bathrooms). Too impractical. Have you tried looking in some of the books or magazines that they have near the checkout at home improvement stores? They usually have more normal looking rooms. I feel for you. Our bathroom remodel took YEARS. And it was our only bathroom. I had to take a bath for nearly a year (no shower option).